Oaky, so I'm not a loser but a. I couldn't do my original "L" post and b. needed to share two things with you. One, the title of this comes from the fact that my Whole30 turned into Whole10. I made it a whopping 10 days and just could not force feed myself without the help of things like cheese any longer!! Here's a recap of my days. This is totally doable. The food is delicious! The only bad thing is all the dang prep time I'm spending to make said food. TWO hours on one dish is a little much. I'm a baker. You make it and pop it in the oven. I was having to stand at the stove and chop up like a million veggies for these dais two hours. Why is every meal today making me gag? Even this Spaghetti Squash with TJ's Marinara that smells and tastes delicious causing such an involuntary reaction? Yum! So glad I can have fruit for breakfast and I have some leftover Spaghetti Squash for lunch. I knew my body was just being crazy yesterday! I even made it through dinner at a catered event. Sure, I had to explain why I wasn't eating the bread and the perfectly delicious looking rice or why I picked all of the cheese off of my Caesar salad. I can do it. I'm over the slump and I'm finding out the hardest days are just over the hill. There you have it. I realized pretty quickly that this was not going to be a lifestyle change for me and that trying a 30 day fast may have been easier for me. I was already to the point of not wanting to eat anything at all and I hadn't even made it to the days of "bored" with my meals that they said would come. I'm glad I tried it. My body didn't feel any different because other than when I splurge I'm careful about what I put into it. I will say the only thing I noticed when I at all the bad things is the sugar high carbs give me. That's it. No extra potty trips, gas pains or anything else. Now...my friend S that has auto-immune issues is still going strong and I couldn't be MORE proud of her. She has seen amazing results and that's a huge motivator for her. Two...Now onto my weekend happenings! Since I had already made my decision that I was DONE with the Whole 30, I was going to stop for a tall, non-fat, no whip Peppermint Mocha at Starbucks on my way in to work. Then I after passing two Starbucks I see that my usual stop is filled with cars. Normally 4 cars in the drive thru is my limit and I'm pretty sure there were 8-10 cars in line WTF?! Plus I couldn't even get into the parking lot due to said line so I was kind of already in a bad mood when I got to work! Epic fail at work Friday morning. All calls for the first three hours made me lose my crap, cry and pound on my desk. I get a little out of hand when every call is a complaint and/or wanting to know when their AM job will be there and it's STILL AM! So, because of this I was of a rebellious frame of mind and broke my Wallet Watch a little bit to buy my mom Frozen and some chocolate Easter candy. The day of the UCF Spring Game! I got up a little early to drop my little brother at Starbucks and get in an hour of blog reading before I had to meet S to head to Orlando. Yes, little bro works at Starbucks and not only do they have pink sleeves for a long time now, they're getting pink aprons and I told him that would be a perfect gift for me! For lunch, S and I got Chipotle salads, see I am making better food decisions sometimes! When we got to the Spring Game, there was tailgating and free parking super close to the field so I didn't get in many miles of walking, but that's okay. We didn't stay for the entire game because I'm the silly girl that forgot sunscreen was a necessity once Winter was over in Florida. *shakes head* So I'm definitely fried and coconut oil has become my friend on my thighs, chest and arms. After singing at church we had our last meeting before Easter Sunday and I committed to making some Easter cupcakes! I'll be pinning ideas for these this week. Are you following me on Pinterest? I had been wanting to make wooden bunny door hangers, so dad and I spent some time Sunday afternoon getting them cut out so I could paint them!! I'll show you the finished product soon. To see it first, make sure you're following me on Instagram! 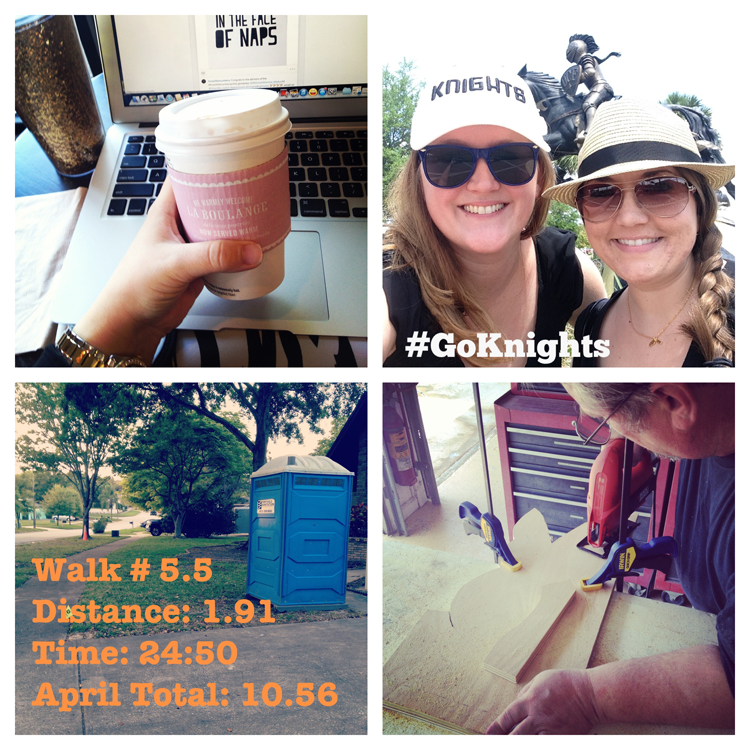 Then I spent some MORE time reading blogs and got to writing my L-Q posts! I can't believe April is half over! 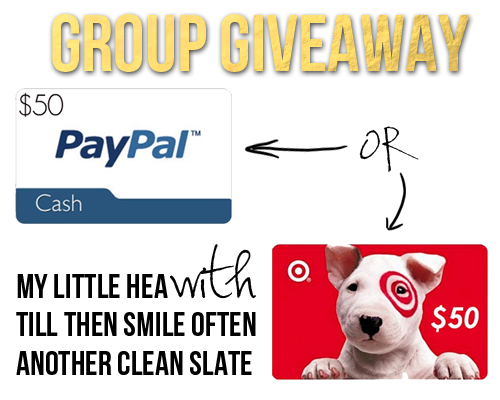 Don't forget to check out the Group Giveaway to win a $50 gift card or Paypal cash I'm participating in with Kerry and Kate! Why couldn't you have fruit for breakfast?? I am impressed you made it ten days! I struggled with the Whole30 too- I kind of half cheated the whole time. I will say I definitely am more aware now. I don't think I could handle doing a challenge like this. I don't like anything healthy. At least you tried, which is more than most people can say (myself included). I had never heard of Chipotle until two summers ago. We just got one here, but I still haven't gone. Yay for Easter cupcakes! Cant' wait to see them. Wow. 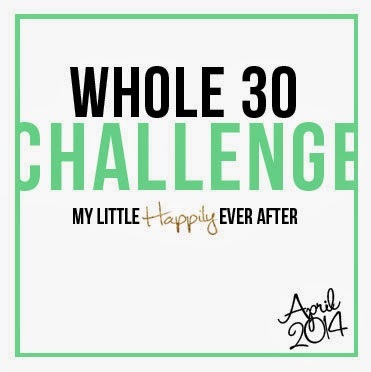 I think you deserve a flippin' medal for lasting 10 whole days on that whole 30 challenge! I think I would be WAY too cranky being so limited haha. Like seriously, I would fear for my fiancee's life. I can't believe April is already half over too!! Crazy! !